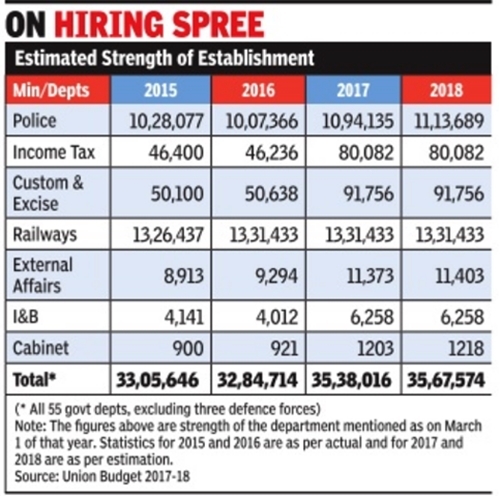 New Delhi: The size of the central government, particularly police and tax officials, is likely to grow with the Centre’s Budget providing for the recruitment of around 2.80 lakh more staff. Of this number, more than 1.80 lakh would be recruits to departments of police, income tax, customs and central excise. As of March 2016, the central government had 32.84 lakh staff across 55 departments and ministries, including 13.31 lakh in railways, but excluding defence forces. This is projected to rise to 35.67 lakh by March 2018 if the recruitment goal is achieved. Strengthening enforcement agencies seems a priority with budgetary allocations made for expansion of police forces (central paramilitary and Delhi Police), taking their strength from 10.07 lakh to 11.13 lakh by March 2018. The Centre in its Budget has provided for the recruitment of around 2.80 lakh more staff. The income tax department, the agency involved in the drive against black money post-demonetisation, is set to expand from the existing strength of 46,000 to 80,000 by March 2018. Similarly , customs and excise department, which will implement the ambitious goods and services tax regime, will get additional manpower of over 41,000.The current strength of 50,600 for customs and excise staff is to go up to 91,700. A review of the estimated strength of establishment in the Budget annexures indicates no change in the manpower of railways, the single largest employer (13.31 lakh) other than defence, in the three years till 2018. Departments of space, atomic energy , cabinet secretariat and the ministries of information and broadcasting and external affairs are some others where sanctioned strength has gone up significantly. The government had projected to increase its manpower in 2016 by 1.88 lakh but failed to make fresh recruitments in I-T, customs and central excise departments.This led to an erosion in the employee base by at least 21,000 over the strength in 2015. People superannuating far exceeded new employees. PM Narendra Modi's interest in foreign policy has translated into a significant jump in the strength of the foreign ministry where the government has decided to add over 2,000 employees -up from 9,294 in 2016 to 11,403 in 2018. The I&B ministry , too, has increased its sanctioned strength from 4,012 two years ago to 6,258 in 2018.The cabinet secretariat has been strengthened with manpower to go up from 921 to 1,218 by next year.